KUALA LUMPUR (17 Nov 2018) – It was a good of two halves and for the Philippines, they did just enough in the first to score a close 3-2 win over Timor Leste in a Group B tie of the AFF Suzuki Cup here at the Kuala Lumpur Football Stadium. Timor Leste did not fail for the lack of trying tonight but that tad extra experience which the Philippines had was just too much quality for Timor Leste as they succumbed to their third defeat in as many matches. “The second half was not good enough. We could do better, much better,” said Philippines head coach Sven Goran Eriksson. The absence of two key defenders meant that Timor Leste head coach Norio Tsukitate had to move things around a bit as the Philippines also opted to bring in Michael Falkesgaard in place of regular keeper Neil Etheridge. And just five minutes in, Nelson Viegas provided the first test for the Philippine’s backline when he beat the offside trap for a shot that had Falkesgaard scrambling for the save. 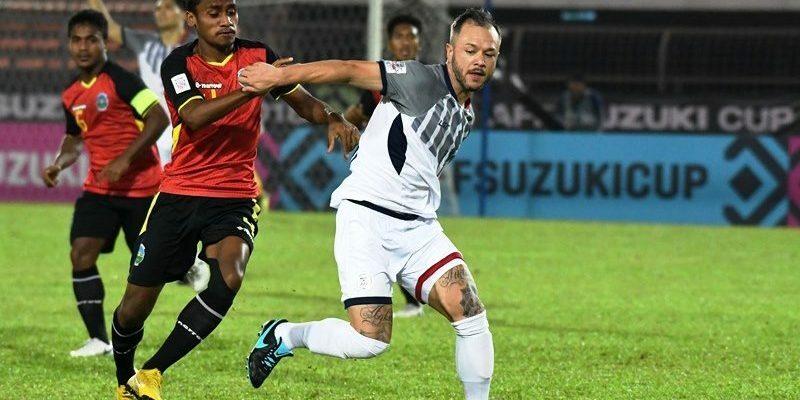 But as Timor began to push forward, they left holes at the back and 27th minute cross from Stephan Schrock was put into goal by the waiting Philip Younghusband. Five minutes later, the visitors doubled the advantaged when Martin Steuble fired in a stiff grounder to put them two goals ahead at the break. But Timor Leste did not lose shape and while the match got more robust with several yellow cards being flashed for both teams by Brunei referee Amdillah Zainuddin, they still pushed on and gave the Philippines a hard time. When the third goal came in the 68th minute with defender Carlos Martinez de Murga making good on a freekick, Timor did not lie down and where it took them just four minutes to nail their first goal of the game. With Paul Mulders penalised for rough play inside the box, captain Nataniel de Jesus Reis stepped up for the penalty to send Falkessgaard the wrong way. And in the 76th minute, Timor grabbed their second goal of the game with Joao Pedro Freitas beating his marker before slotting in past Falkesgaard. With the whiff of a draw close, Timor stepped up several gears against a fast tiring Philippines side. But in the end, the chances were not close enough for them to at least fight for their first point of the competition. “We really wanted to win this game but it was not to be,” said Timor Leste head coach Norio Tsukitate.